Sorry, Mom. I didn’t mean to throw you under the bus (figuratively, people), but c’mon! Wasn’t there a better way? So, standing there in the store, I imagined it the way I’d seen it in some cookbooks and magazines: halved and hollowed, with a savory meat filling. It inspired me to give it a try. I bought them, and brought them home. I spent a while looking over cookbooks an ‘net recipes. Many of them caught my eye, and I got many good ideas. The day I decided to make them, however, I decided to make them on my own. The first step was the meat. I wanted some sausage, to give some edge to the dish, but we were out. It was on a sunday, so I didn’t want to go shopping. I looked for some ground meat, and I found some in our freezer, but I wasn’t sure what it was. It looked like some game meat grind that a hunter friend of ours had given us. I think it was elk. Before church, I put it in some cool water to thaw. After church, I got a bowl and started mixing in herbs and spices. I paid attention to what I put in, and in what amounts so that I could write it up later with some accuracy. That’s what I’ve got listed here. Adjust it to your taste and to the amount of meat you’ve got. Mine ended up a little too hot and spicy, so in the ingredients above, I’ve reduced the crushed red peppers, but only slightly. Since this was probably a game meat, I added some olive oil (it was obviously very lean), and a few dashes of vinegar to ease the game-y taste. I set that aside in the fridge so that the flavors could seep in. It would still be a good hour or so before I would use it. Then, I went out and lit up some coals. While those were whitening up, I prepared the squash. I halved each one and scooped out the seeds and goop. I dusted (lightly) the inside of each one with a bit of brown sugar. I set them in one of my 12” dutch ovens, with a bit of water in the bottom, and set that on the coals, with more coals on the lid. I got the other dutch oven on the coals, too, underneath, heating up while I cut up the veggies. I put in everything but the tomato to saute. Once the onions were translucent, I added the tomatoes and stirred to cook. finally, I pushed everything aside, and added the meat in the middle. As it cooked, I mixed it all together. 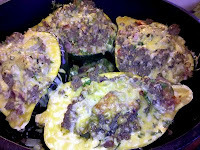 While this was happening, I occasionally checked the flesh of the squashes for doneness. I’d just stick them with a fork and when it was soft and didn’t resist, I knew they were done. I pulled them off the coals, and removed them from the oven, so I could pour out the water. This was about the time that the filling mixture was done, so I put the squash boats back in the Dutch oven and put a scoop or two of filling in each one. Even though I mounded it up pretty high, there was leftover, so that’s good for a lunch. I sprinkled on the parsley an the cheese, and put it back on some fresh coals (over and under, with extra emphasis on over) to bake for a bit. At this point, all of the food is cooked, so I didn’t leave it on long. I just wanted to bake all of the flavors together, and to melt and brown the cheese a bit. After that, I brought it in and served it up. Brendon had seconds.